We want to say thank you to the WNC AgOptions selection committee for choosing the Addison Farms Vineyard grant application as one of the projects to fund for 2013. 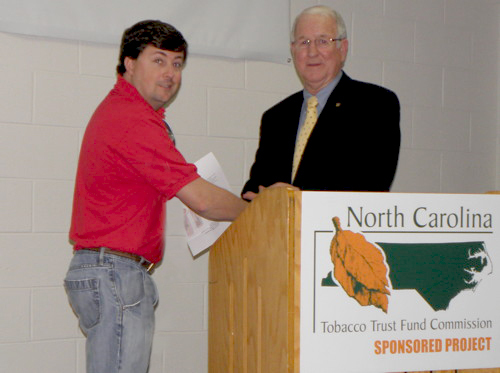 WNC AgOptions is exclusively funded by the N.C. Tobacco Trust Fund Commission, as it has been since 2003. This year, WNC AgOptions funded 28 different projects across 17 counties in western NC. This program has funded over 350 projects during its ten-year history, with over $1.6M in grants to help individual and cooperative farms fund innovations, including the introduction of new crops, hydroponics, specialized equipment, organic farming techniques, marketing initiatives and other improvements and growth opportunities for small farmers. North Carolina received approximately $160M in funding this year from the settlement with tobacco companies. The N.C. Tobacco Trust Fund Commission is funded through this settlement; they received ~$2M this year.